Sounds of Spring among Myriad Households (萬戶春聲), Liu Quanzhi (1739-1818), Qing dynasty. Chia is not the usual type of young man that you would bump into on the streets or inside MRT trains. Despite being very low-profile, he is the dearest grandson of the Chia family. Speaking of the Chia family, they are rather mysterious—only nobles and top-notch celebrities are invited to their ultra-luxury mansion once in a while. The Chia family’s prosperity dates back to 1800s when Chia’s fourth great-grandfather was a duke during the Qing Dynasty. Even till today, the Chia family still possesses many precious jewellery and priceless porcelain treasures from that era, and they observe exquisite traditional Chinese customs and rituals especially on big days. One such event that outsiders rarely get to see is the family making offerings and sacrifices to ancestors on Chinese New Year Eve. The Chia family’s Hall of the Ancestors is in a separate courtyard of its own in the west part of the house, away from the more domestic part of their mansion. On the way towards the main hall, one can see a framed board inscribed in a Qing emperor’s calligraphy with words honouring the Chia family at the time, which the Chias are deeply proud of even till today. The whole ceremony is very intricate. For instance, when offering sacrifices, by ancient custom, men of the family are divided in ranks to the left and right of the hall, so that fathers and sons are separated to the left and right lines while grandfathers and grandsons stand in the same line. On the night of Chinese New Year Eve, servants and children of the family receive red packets in the form of gold or silver medallions in little embroidered purses, or gold or silver ingots. The New Year reunion feast was usually laid with tables on the east side of the hall of Chia’s grandma’s apartment for men and boys, and tables on the west side for girls and women. Herb-flavoured Tusu wine (屠蘇酒) and He Huan soup (合歡湯), lucky-fruits (吉祥果) and wish-rice cakes (如意糕) are the very traditional drinks and foods the Chias would have. Tusu is medicinal wine traditionally drunk to celebrate Chinese New Year. Su is said to be the name of a ghost and Tu means to eradicate. Hence, by drinking the wine, evil spirits may be expelled. 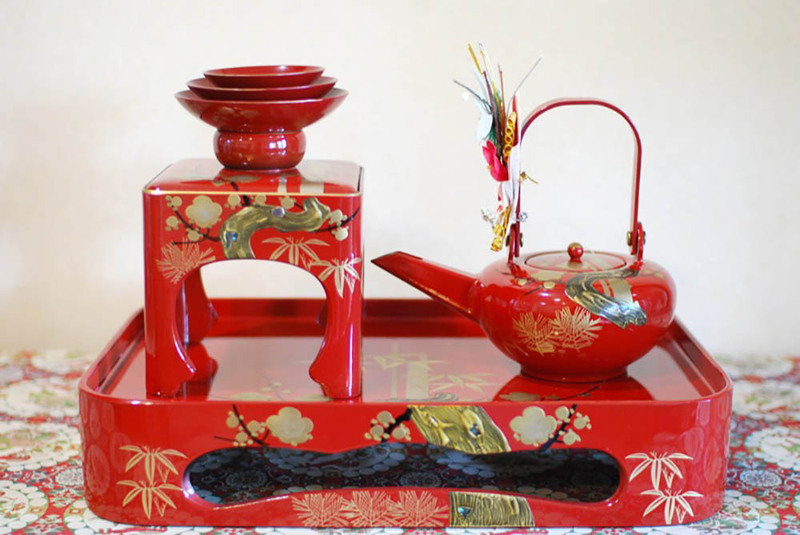 Today, Japanese still drink a similar version of Tusu wine, which they call ‘O-toso’ for their New Year celebration. He Huan soup is cooked with Persian silk flowers, for its Chinese name He Huan (合欢) bears the sweet wish for love and joy. Lucky-fruits are usually fruits or candied fruits with auspicious patterns and words inscribed on them. 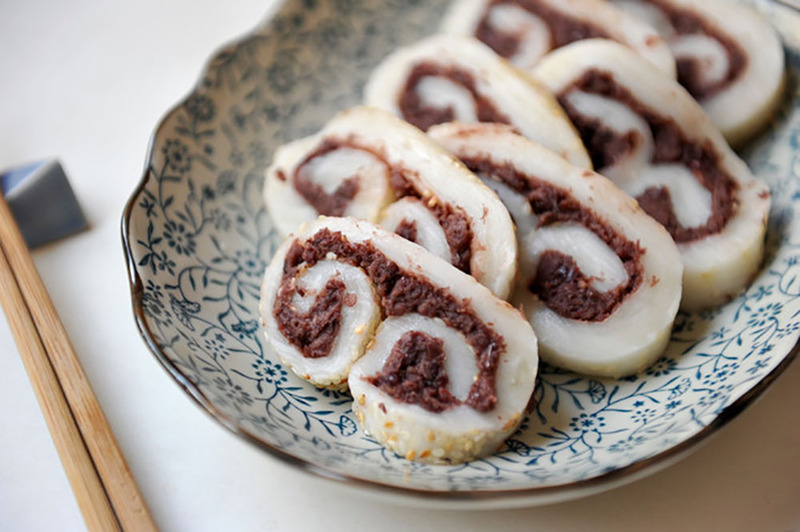 Wish-rice cakes are made to look like jade scepter (玉如意), which symbolises power and good fortune. The Chias are also very particular in following the traditional custom of sending off and welcoming the return of Kitchen God (灶神), who reports the vice and virtue of households at the end of every lunar year to the Jade Emperor (玉帝), a supreme deity in Taoism. They also pay reverence to the Buddha and other deities, as offerings of cakes and burning joss-sticks are made in front of all the Buddha-shrines and in all the little niches of the Kitchen God, who is welcomed back on the night of Chinese New Year Eve from his annual trip aloft. In the main courtyard outside Chia’s mother’s apartment, an ‘altar to heaven and earth’ would be set up. It is a long table on which offerings of sticky fried honey-sticks, fresh apples, steamed wheat-flour cakes and other goodies had been built up, layer upon layer, into a little pagoda of offerings in front of a large colour-print representing the whole host of heaven. So, who is Chia and how is his old money family like? Well, if you are interested, reading David Hawkes’ ‘The Story of the Stone’—a translated version of the Qing dynasty novel ‘Shi Tou Ji’ (石頭記), or more famously known as ‘Dream of the Red Chamber’ (紅樓夢)—may provide you with more details of how the lives of old money families were like during the Qing dynasty. The above story of Chia is adapted from a chapter on Chinese New Year celebrations in ‘The Story of the Stone’. Although the author mainly told the stories of the wealthy in the book, the same New Year customs were followed by rich and poor families in society at the time. 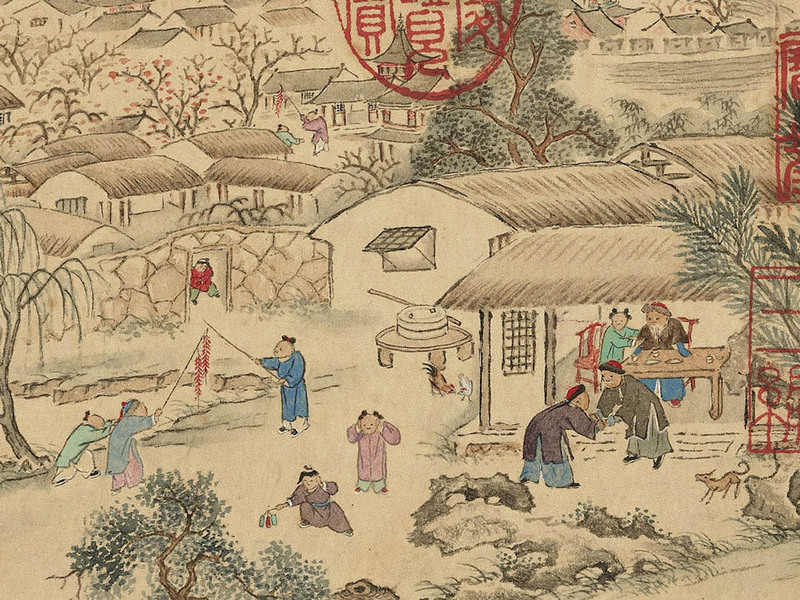 According to Taiwan’s National Palace Museum website, the Qing dynasty painting in this article, ‘Sounds of Spring’, depicts scenery associated with the New Year. Why Did Ancient Chinese Celebrate Lunar New Year? What is the meaning behind celebrating Lunar New Year, or in Chinese, ‘Guo Nian (过年)’? According to the ancient text ‘Guliang Zhuan’ (穀梁传), it can be considered a year following the harvest of crops (五穀皆熟，為有年也). Hence, from ordinary folks to emperors, people would make offerings to gods to pray for a smooth new year with abundant harvest towards the end of the old year. 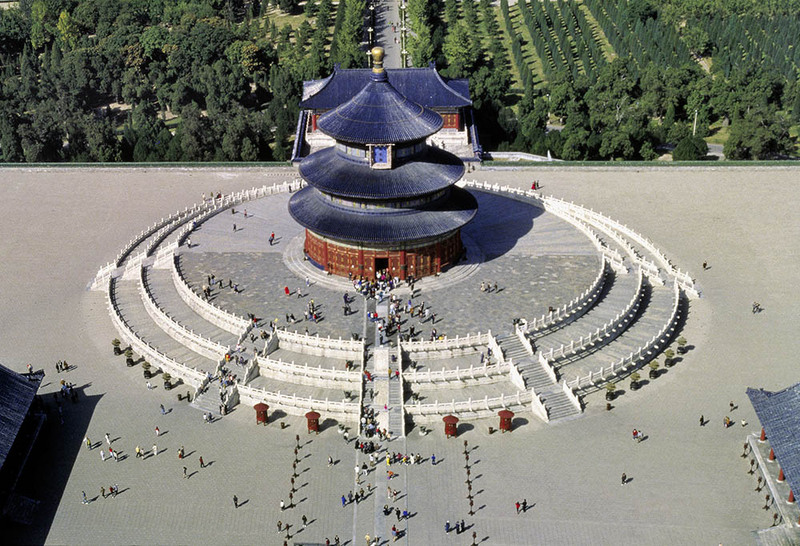 Qi Nian Dian (祈年殿) inside the Temple of Heaven (天壇) in Beijing is where Qing emperors prayed for harvest. In the past, it was believed that the prosperity of a nation relied on the virtue of its emperors. The ancient Chinese would also make offerings to Taoist deities and Buddhas, as well as their ancestors, à la the story of the Chia family. Although most of us in Singapore now see it as a two-day public holiday, traditionally, the celebration of Lunar New Year may span over a month, starting from Laba Festival (臘八節) and ending with Lantern Festival (元宵節). Nian Dian (祈年殿) in Beijing, where Qing emperors used to pray for harvest. In the past, it was believed that the prosperity of a nation relied on the virtue of its emperors. Laba Festival is celebrated on the eighth day of the twelfth lunar month. Legend has it that one day, Sakyamuni travelled to Maghada, an ancient Indian kingdom, while cultivating Buddhahood. However, he passed out due to hunger and thirst. A kind shepherdess saved him using congee cooked with glutinous rice and some wild fruits, and it happened to be on this day—the eighth day of the twelfth lunar month—that Buddha Sakyamuni achieved enlightenment. Therefore, as part of the celebration of Laba Festival, people would eat Laba congee (臘八粥) and temples would also give out free congee to the public to commemorate this day. 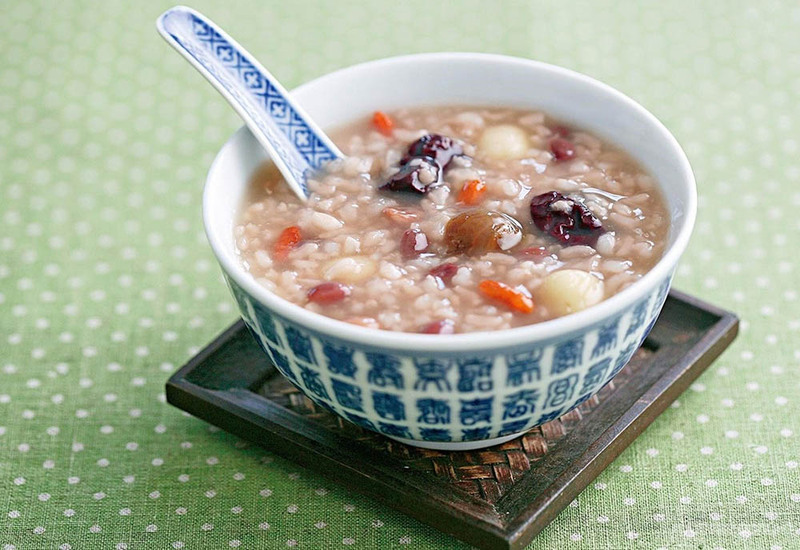 Records of eating Laba congee can be found in texts from as early as Song dynasty. For instance, ‘Dreams of Splendour of the Eastern Capital’ (東京夢華錄) contains vivid descriptions of how Laba was celebrated back in the Song dynasty. Lantern Festival falls on the fifteenth day of the first lunar month; at night, people would appreciate the first full moon of the year. This festival has roots in both Taoism and Buddhism. Following Taoist tradition, Lantern Festival is also called Shangyuan Festival (上元節), which celebrates the birthday of Tianguan (天官), the Taoist god in charge of fortune. Then how has it evolved to become Lantern Festival? It is said to be associated with Emperor Ming of Han (漢明帝). Emperor Ming of Han, a very loyal follower of Buddhism, ordered all households, temples and the imperial palace to light lanterns on the night of the fifteenth day of the first lunar month, which symbolises the spread of Buddhism. If you enjoy appreciating the lanterns in Gardens by the Bay during Mid-Autumn Festival, you may be amazed to know that ancient lanterns really aren’t less magnificent. There could be lanterns stacked into a mountain that resembled a giant marine turtle (鼇山燈), as per Chinese mythology. Children could play with movable lanterns that were often in the shape of a rabbit, deer or elephant. Today, through ancient paintings and texts, we can still feel the joy of people in the past during the month-long celebration of Chinese New Year, which was full of bustling events and entertainment. To them, it was a time to express gratitude and reverence to gods and ancestors, to share happiness with family members, and to seed hope for the future. Joyous Matters of Approaching Peace (昇平樂事圖), Anonymous, Qing dynasty (1644-1911). 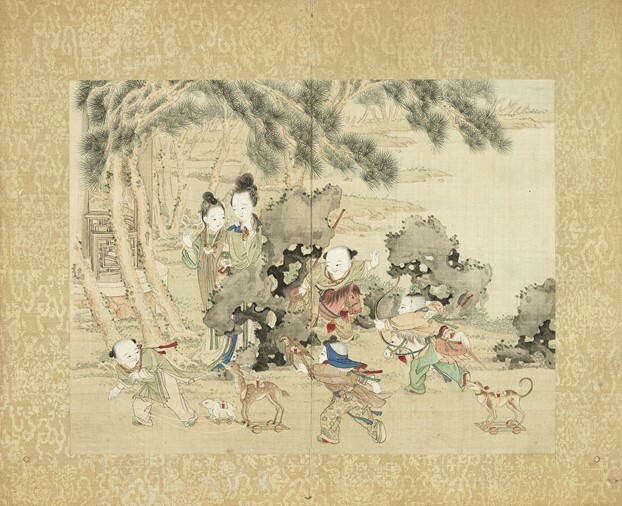 An album with a total of twelve leaves depicts court ladies with children playing in courtyards during the Lantern Festival to celebrate the New Year. In the paintings are lanterns decorated in the form of an elephant, crane, deer, bat, hawk, rabbit, and the God of Literature. Their great variety and refined production reveal the lavish lifestyle of the Qing court during their New Year celebration, with nothing left out. Credit: National Palace Museum, Taipei. 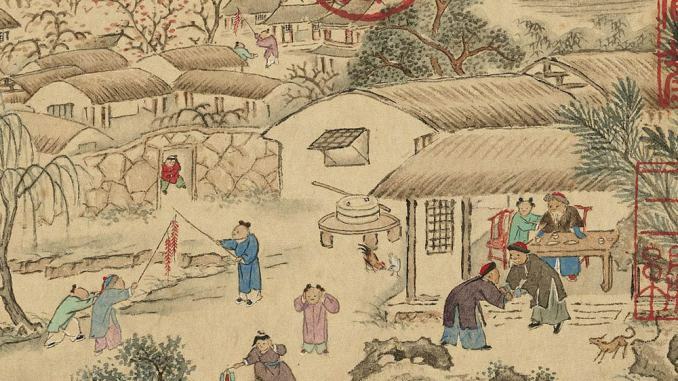 Part of a painting depicting the Chenghua Emperor (成化帝) celebrating Lantern Festival with families in the Forbidden City. Acrobatic performances, operas, magic shows and setting off firecrackers can be identified in the painting.